When Can My Kids Start Wearing Contact Lenses? Most eyecare practitioners are reluctant to fit children with contacts before the age of 12, however; depending on the maturity level of the child, the professional may decide to make exceptions. Some small children wear contacts, babies as well. According to the CDC, 10% of contact wearers are under 18 years old. That said, there are some teenagers who should not wear contacts. It all boils down to one basic question: is your child mature enough to wear contacts? Is the parent available to give the child the attention they need to safely wear and maintain their lenses? To decide if your child is ready to wear contacts it’s important to exercise caution, and determine your child’s maturity. Special considerations for physical activities, cosmetic lenses, or more expensive daily disposable contacts for teenagers require additional considerations. Contacts are a medical device used to correct vision. Basically, you’re introducing a foreign body to the surface of the eye. As with any medical device, if it’s not treated with care when handling and maintained properly it can cause significant damage to the eye as well as your pocketbook. Lost contacts, torn contacts and contacts not properly maintained may cost you big bucks in replacement costs depending on the type worn. An even bigger price may be paid by your child if the contacts are not treated with respect and properly maintained. Contact lens complications may give rise to sight threatening problems which may take several weeks to resolve or even diminish the ability of the eye to see indefinitely. Over the past few decades wearing contacts has become second nature to some due to their inherent simplicity. However, just as with any medical device contacts also possess inherent risk when not used properly. Contacts can harbor bacteria, allergens, deprive the eye of oxygen, cause irritation, and alter the shape of the cornea if not fitting properly. Establish a standard for determining maturity. For example, does my child keep their grades up? Does my child remember to do their chores around the house? Is my child good about maintaining his/her hygiene such as brushing their teeth or combing their hair? If you can honestly answer yes to these questions, then your child is probably ready. If not, then you should probably stick with glasses for now until they can learn to be more responsible. There is no magic age at which every child should start wearing contacts. Maturity will ultimately be the determining factor. Like most parents, you are not with your child 24 hours a day. Your child attends school, sporting events, sleep overs, etc. Most likely you have a busy work schedule. We’re often lucky to even have dinner with our children at times. Let’s face it. If your child has difficulty inserting/removing their contacts, or cleaning properly when you’re not around, then they are not ready to take on the responsibility. Contacts in some ways have become a rite of passage, just as important as owning a cell phone, learning to drive, babysitting, etc. The determination of whether they are ready ultimately rests in the hands of the child as demonstrated by their behavior. What Makes My Child a Good Candidate for Contacts? Before your child gets the go ahead to wear contacts, there are a couple of tests performed by the doctor before contact lenses are even considered: lid eversion and a tear breakup timing test. Lid eversion involves turning the eyelid over and carefully examining the underside to ensure there are no protrusions which may interfere with contacts as the patient blinks causing it to be moved off center. A tear breakup timing test will measure the child’s ability to produce enough natural tears to keep the contacts moist throughout the course of wear. If an adequate supply of tears is not being produced, wearing contacts will become uncomfortable, visual acuities will suffer and lenses may not stay in place. If these conditions are satisfactorily met, the patient will be fitted with diagnostic lenses to determine which radius and curvature works best for the shape of the child’s cornea. Why Can’t My Child Wear Contacts? Unfortunately, certain conditions may prevent your child from wearing contact lenses. There are several modalities available on the contact lens market to correct every refractive error from astigmatism to presbyopia. However, there are some instances in which children may not be able to wear contact lenses due to special circumstances. A condition typically caught early in childhood is strabismus. Strabismus results due to the extraocular muscles that control the movement of the eyes not working in tandem. This inability to work together will not allow the eyes to align properly and causes a condition known as diplopia (or simply, double vision). This condition is generally corrected with the introduction of prism to the child’s prescription. Prism moves the optical center of the lens either vertically or horizontally to correct for the image imbalance suffered by the patient. If not addressed, the brain will begin to suppress images from the eye not working properly. As the patient develops, the lack of information from this eye will cause the brain to suppress images received from it via the optic nerve. Eventually, blindness or very limited perception will result. Since contacts rely on the radius of curvature to match up directly with the steepness of the cornea, the optical center must be seated directly in front of the visual pathway; the axis light travels to allow the process of vision to occur. Therefore, it is not possible to correct this problem with contact lenses, precluding a child (or any patient who requires prism) from wearing contact lenses. Children with high degrees of astigmatism may also not be good candidates for contact lens wear. It is extremely difficult to fit patients with substantial amounts of astigmatic correction. Toric contacts, those used for astigmatism correction, are designed to correct vision in two different planes located 90° apart. This means they must not only be seated properly with the optical center directly over the visual pathway, but they must also remain stationary with minimal amounts of rotation. Depending on the degree of astigmatism, even the slightest amount of rotation when the patient blinks or rubs their eye will cause a period of disrupted visual acuity known as rotational recovery. If the contact is not fitted well, this rotational recovery period may occur every time the patient blinks causing frustration and distorted vision. If a child is having particular trouble with reading well, the cause may be visual. When a person shifts their gaze from distance vision (anything past two feet) to near vision the pupils will converge inward approximately 3 mm. If one eye does not converge properly during this process, it will either cause double vision when viewing something up close (such as in the case of reading or doing school work) or make it difficult for the eyes to compensate, thereby, fatigue the eyes and causing the child to avoid the task altogether. In these instances, bifocal lenses are prescribed. Typically, lined bifocals are used to allow the child to readily acquire the reading area of the lens and function well when doing visually concentrated tasks. Of course, a child could wear contacts in an instance such as this with simple readers to be used in conjunction with the contacts, but there is often a social stigma attached to this modality causing children and parents to simply opt for spectacles to correct the problem. Thankfully, this condition is typically temporary and as the child develops, he/she will grow out of it. What Are My Child’s Options? The good news is there has never been a better time to be a contact lens wearer. The options for contact lens wearers has definitely improved over the past several years and the advantages are almost overwhelming when weighing one contact lens brand over another. It is best to defer to the professional opinion of your eyecare professional. Your doctor knows your child’s ocular history, unique refractive needs and usually is able to make a good determination as to whether your child will meet future hygienic responsibilities. 1. How much oxygen are my eyes receiving? 2. Will the contacts remain moist throughout the day? 3. Will the contacts repel debris, proteins, allergens and bacteria? All of these questions go doubly for children since they may not be as responsible as adults in taking care or their lenses and observing strict wearing regimens. Luckily, the last few years have seen great advances in the quality of materials used in the manufacturer of contact lenses. Hydrogel lenses comprise most of the soft contact lens market today. Hydrogel materials are hydrophilic meaning they absorb moisture and retain it. They allow more oxygen to permeate the contact between the surface of the cornea and the atmosphere and they’re typically coated to repel allergens, bacteria, denatured proteins and other harmful debris. Adding to the strides made with hydrogel technology, there are several daily disposable lenses available to children. Being able to simple toss the contacts out at the end of the day and start fresh the following morning decreases the likely incidence of developing significant contact lens complications or diminishing visual acuities if the lenses are not properly maintained. These innovations have gone a long way in easing the minds of patients, eyecare professionals and parents alike. Contact lenses are better designed to address the refractive needs of children and adults better than at any other time in the history of soft lenses. Contacts are available in a greater number of fitting parameters to accommodate patients with substantial degrees of hyperopia (far-sightedness), myopia (near-sightedness) and astigmatism. Modern advances in aspheric designs have allowed these patients an even greater level of comfort and visual acuity not considered 20 years ago. The astigmatic child has a wider range of options available as well. Toric lenses are weighted to provide the patient with a stable contact that will correct the child’s vision in two separate planes at right angles to one another. The weighting of these lenses is known as ballasting. Innovations in the ballasting of toric contacts have resulted in a more stable lens with less rotational recovery time and greater visual benefits to the patient. 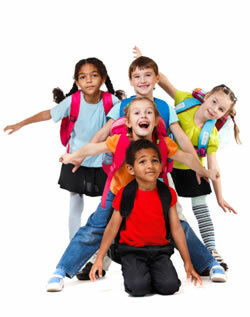 Kids today are involved in a plethora of activities where activity specific contacts may be beneficial. A relatively new addition to the world of soft lenses, these contacts provide children with benefits such as better peripheral vision, an unobstructed field of view, less chance of injury, more stable vision and better compatibility with safety equipment. Additionally, contacts have the added advantage of not fogging up or becoming muddy as is often the case when doing activities in spectacles. Some contacts are designed with special tints to improve contrast sensitivity perception and reaction times in certain cases, for example, catching a ball or anticipating other player’s actions. This translates into great advantages in processing information quickly and giving your kids a leg up in their activities. In essence, contact lenses are medical devices. They and the solutions used to maintain the proper hygiene required for wear are regulated by the Food and Drug Administration. Federal law requires patients be evaluated at least once a year to maintain ocular health with respect to contact lens wear. Unless defined by state law, the FDA regulates contact lens prescriptions are not valid after one year. This prevents patients, sometimes both parents and children, from over-wearing their lenses, or if an asymptomatic problem develops, having it treated before it becomes a major complication. Not practicing good hygiene could have potentially damaging affects not only to their vision, but to the eye itself! What is Good Contact Lens Hygiene? Just as with anything we teach our children, it’s always important to cover the basics. In some instances, maintain good contact lens hygiene may appear to be common sense, but it’s also important to remember that if the basics are not adequately covered, bad habits may develop. Remembering to wash your hands and dry them thoroughly is one of the most important preventative ways for reducing your risk of eye infections. You should always wash your hands with antibacterial soap and dry them thoroughly with a lint free paper towel or cloth. It’s important to remember that anything our hands come into contact with (even the fibers from paper towels or drying towels) will be transferred to the contact lens then on to the patient’s eye. Kids should be taught to remove their contacts in the evening before going to bed (if not approved for continuous wear). After removing the contact from each eye, the lens should be placed in the palm of the hand, a liberal amount of contact lens cleaning solution applied, and vigorously cleaned by rubbing the contact lens back and forth. This will not only ensure the lens is being properly sterilized, but also removes any protein deposits, allergens or other debris which may have built up on the contact surface. It’s important to remember that saline solutions and rewetting drops are not disinfecting agents. It’s important to remember to have your child dump the solutions out of his case after inserting his/her contact lenses, rinsing it and letting it air dry throughout the day. If solutions are not changed regularly, proteins and other debris will begin to build up and eventually be deposited to the eye. Children and their contact lens wearing time should be carefully monitored. Some contacts are designed to be worn continuously, but many are not. Generally, contacts should not be worn more than 16-18 hours a day. Removing your lenses for an 8 to 10 hour period at night give your eyes the opportunity to receive much needed oxygen and nutrients. Ask your doctor for their recommendation about wearing schedules and whether wearing schedules extended are ever safe.